Welcome to a family friendly and cozy 1 bedroom, 1 bath condo on the 2nd floor. 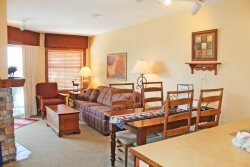 This condo is located at the quiet end of the complex and has a nice view of the tubing hill and courtyard. Relax in front of the log burning fireplace or have more fun in the indoor/outdoor pool, sauna, hot tub and sports bar at Silver Creek Lodge. Satellite television also provided!